I think that I’m basically a cow. Cows are grazers. I’m a grazer. Cows are plant eaters. I’m a plant eater. Cows bodies thrive on plants. My body thrives on plants. Cows have best friends. I have best friends. Cows like solving problems. I like solving problems. Cows like to eat pretty much all the time. I like to eat pretty much all the time. Cows stand on four legs. I stand on… well two, ok I stand on two legs. 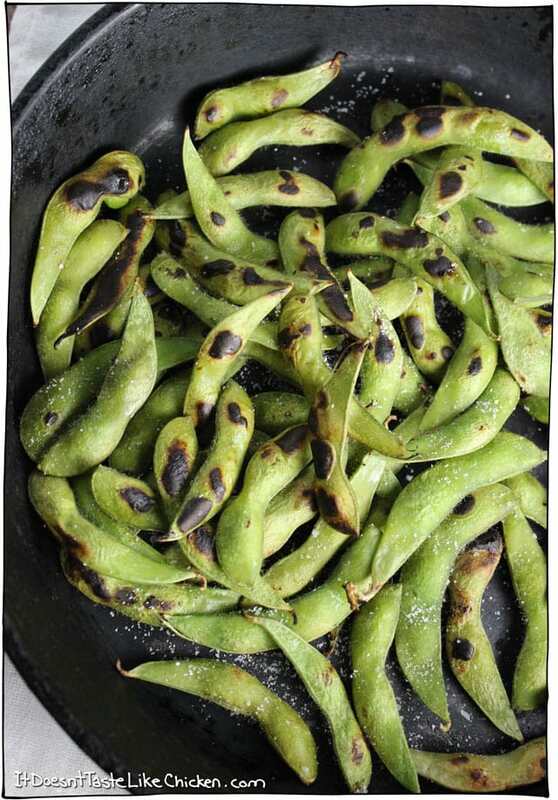 Which gives me the ability to reach the stove, crank the heat, and whip up a batch of Skillet Roasted Edamame. 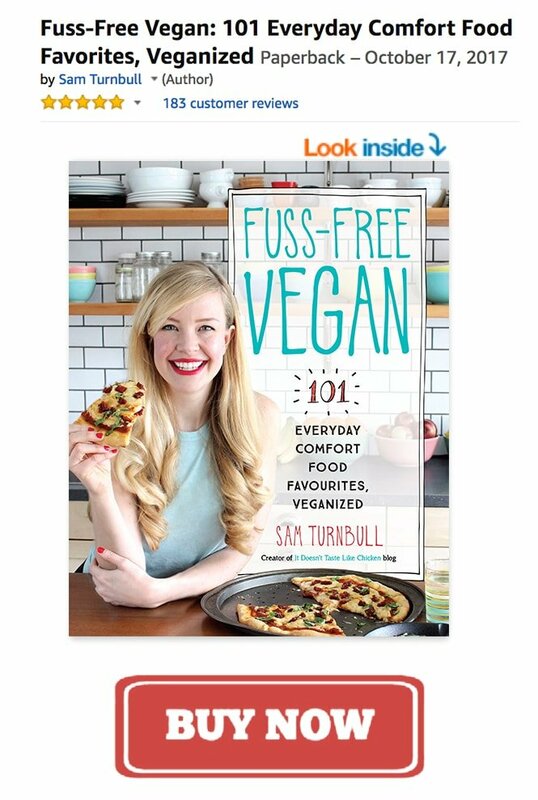 So I may not be exactly the same as a cow… and honestly I am pretty thankful for that (no offence cows!) but I do like grazing all the time. When I graze, I especially love snacking on healthy things. All the snack, none of the guilt. 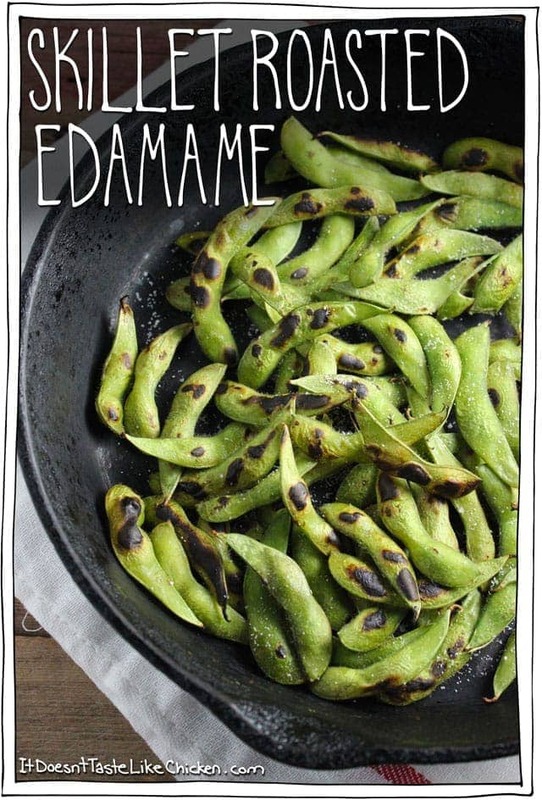 Jam packed full of protein, fiber, vitamin C, vitamin K, folate, and magnesium, edamame is a great choice (not to mention that it’s damn tasty). I have a secret confession when it comes to edamame: I like to turn edamame snacking into a bit of a game. Yes, I play with my food. Table manners: 0, Fun times: 1. To play Edamame Toss, you simply put a large empty bowl (or a small bowl for more of a challenge) across the room. Preferably not near anything fragile. As you eat your edamame you chuck the empty shells across the room and into the bowl. Considering I have terrible aim (and honestly, most edamame shell throwers do), this ends up being pretty fun and ridiculous. There has been more than one occasion where I discovered an edamame shell somewhere random while cleaning the house. Not into the games? That’s cool, just don’t visit me when I eat edamame. What’s the next best thing to edamame toss? Dry roasting edamame. I just discovered dry roasting them like this, and I sure am glad I did. The roasting really enhances the flavour of the beans, and the slightly charred shells add a lovely smokey essence. Really, this takes it up a whole other level, and it’s a level that I am liking very, very much. You can find edamame in the freezer section of most grocery stores, so I always have a bag in the freezer for healthy snacking. Just thaw the edamame in some warm water. This takes about 5 minutes. Then drain and toss it in a hot skillet, and let it char a bit on all sides. This takes about 10 minutes. Sprinkle with a bit of salt if you like, let it cool for a couple minutes so you don’t burn your fingers, then eat them by squishing the beans out of the shells with your fingers or your teeth. The roasting enhances the flavour of the beans, and the slightly charred shells add a lovely smokey essence. Full of protein, fiber, and low in calories. 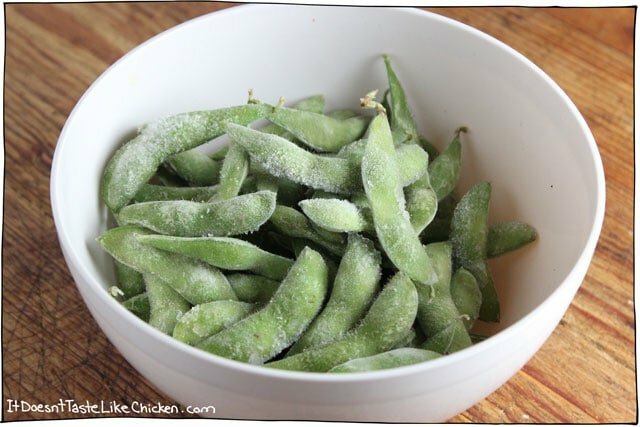 Put the edamame in a bowl of warm water to thaw. I find it faster if you rinse the edamame several times with warm water to encourage it to thaw faster. When thawed (about 5 minutes), drain. Heat a dry skillet (no oil), over high heat. Add the edmame and roast. 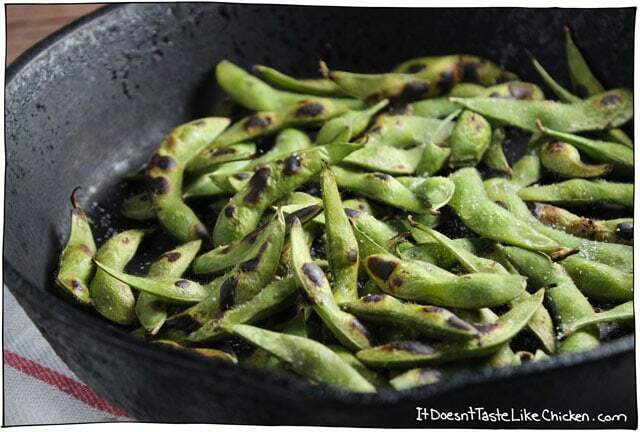 Stir it every now and then, but not too often so the edamame has time to char in spots. It will take about 10 minutes for the edamame to be roasted all over. Toss with salt. Let rest for 5 - 10 minutes before serving so you don't burn yourself. To eat, squish the beans out of the pods with your finger or your teeth. Next time you’re at an Asian market, look for a spice called “togarashi” or “shichimi” – both names are used alone and sometimes together. Our local sushi joint turned me onto this stuff – it will take your edamame to the next level (if you like some spice)! Just sprinkle some on with the salt and prepare to become addicted. I’m totally going to make this just so I can play the edamame bowl toss game! Although I can see my dog intercepting my expert throws : ) We eat edamame all the time but I’ve only ever steamed it so this looks new and exciting! I have to comment that I loved this post. You always have a way with words that I enjoy but I was almost rolling with the core comparison! I forget about the simple things to eat. Perfect for an appetizer and not everything yummy has to be a process and I do love me some edamame. Great idea!